Pasta. We all know that pasta is one of my favorite things in the world. I grew up begging for spaghetti each week. I wanted my mom’s spaghetti when my birthday rolled around each year. Forget dining out. I wanted my mom’s cooking. I didn’t care if it was store-bought boxed pasta noodles. Her sauce made it. And that’s what I wanted. Pasta (in all forms) has been one of my favorite dishes to just dive into. Ultimate comfort food. Ultimate meal. Even after the Celiac diagnosis…one of the first things I sought out were pasta alternatives. There are so many out on the market. Some good…others not-so-good…and some that rise above and beyond the bar. Like…even better than true pasta level of amazing. 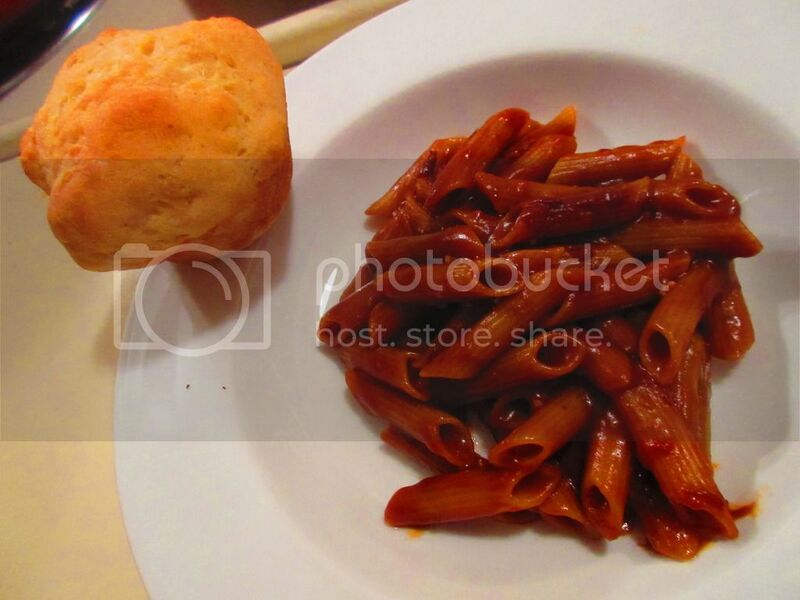 Back in my September 2014 Cuisine Cube, I was presented with a box of Le Veneziane Microwavable Gluten Free Penne Al Pomodoro E Basilico (Penne with Tomato and Basil) Pasta Express. And, yes, even the pasta freak in me didn’t immediately make this up. But…I’ll explain why in a moment. For now, let me give you a quick run through of what Cuisine Cube is all about. Cuisine Cube is a monthly subscription service that delivers healthier, lesser-known, smaller artisan bakers/companies gluten free goodies to your door. Each box contains 5-6 items (breakfast, lunch, dinner, snack, dessert, and a bonus sometimes!) and subscriptions start as low as $29.99. Go to their site and check them out. I’ve really enjoyed my year of Cuisine Cube and intend to keep my subscription rolling. In fact, I might have to go in for the long-term subscription instead of the month-to-month. I’m that committed. LOVE. So…yes…I realize that September is about 7 months ago and that I am just now reviewing a product from that Cube. BUT…it is the last item from the September 2014 Cuisine Cube. And that was one very delicious cube for sure! 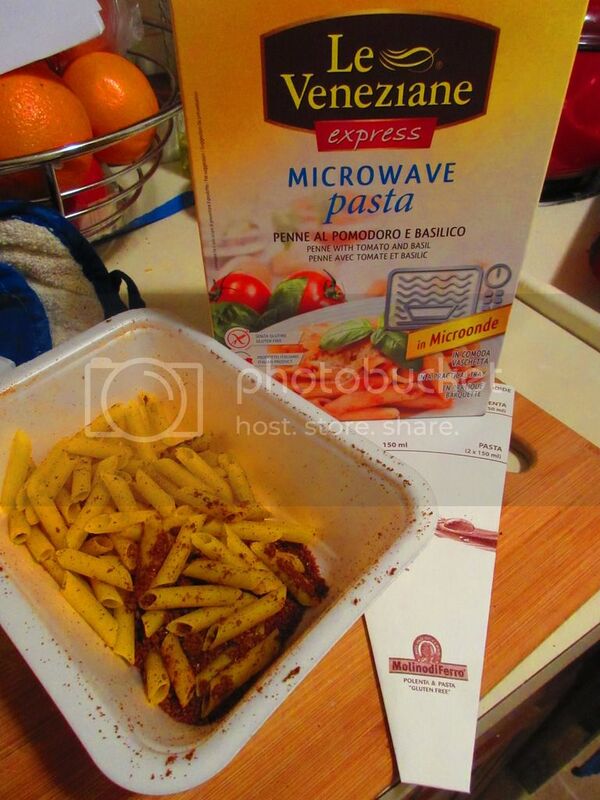 The Dinner portion of that box was dedicated to a 1-serving microwavable pasta meal made by Le Veneziane. Now, I have had Le Veneziane products before and have always been impressed, so I was quite happy to see this company included in the box. I had no idea they made microwavable pasta meals. The things you learn! Le Veneziane corn pasta is actually a very great choice for people trying to stay healthy and for people who follow the Mediterranean Diet. Why? It has a very low fat content. How about that? Le Veneziane is now one of the most modern companies using high-quality corn and producing amazing gluten-free pasta, polenta, sauces, and cookies. They put out a high quality product because they believe in using the highest quality ingredients from flour and corn. It is milled properly and kept in the right conditions to make sure that nothing, including being 100% gluten free, is compromised. Love that integrity and devotion. So, last night after a very busy day that included breakfast at my favorite gluten-free bakery and lunch of gluten-free crepes from my favorite food truck at a festival…I wanted something light for dinner. This was ideal because my roommate and I could split it and it would be the perfect amount. To accompany it, I made some homemade gluten-free dinner rolls (even though I was so tempted just to grab some out of the freezer section). So, while the rolls were cooling, I went ahead and opened up the Le Veneziane Microwavable Gluten Free Penne Al Pomodoro E Basilico Pasta Express. Inside was a microwaveable dish that I peeled the top off of and a measuring cone so that I could get exactly 300 ml of water as directed by the instructions. The corn pasta in the container was perfect. It had this deep red-brown powder inside too. And when I added the water and mixed it well, everything got this muddy brown color. I hoped for the best and popped it in the microwave for 10 minutes. When 10 minutes elapsed, I pulled the tray out of the microwave, a little put off by the brownish color of the sauce. But, I gave it a stir and then dished up half to my roommate and half for me, giving us each a dinner roll to have with it. When I handed her the bowl she said, “That’s an interesting color sauce.” HAHA!! Everyone was thinking it; she just said it aloud. 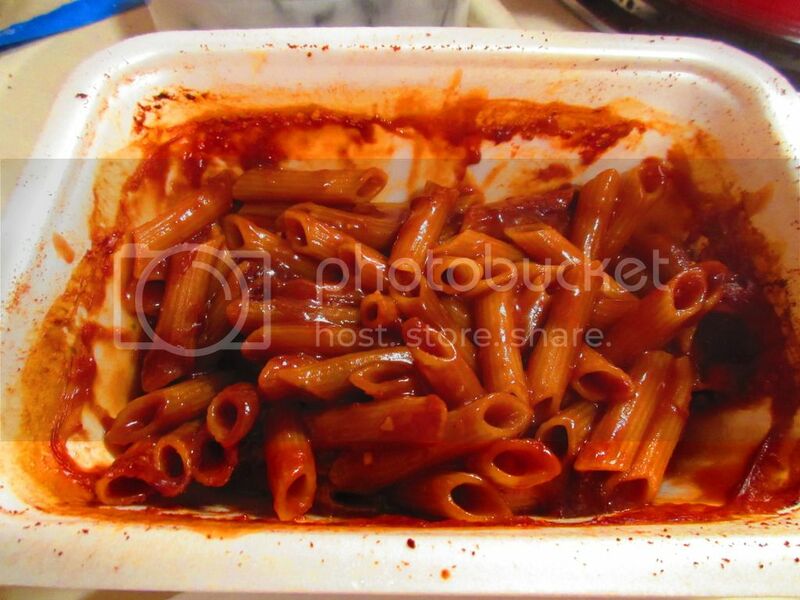 Well, despite the rich brown color of the sauce, the Le Veneziane Microwaveable Gluten Free Penne Al Pomodoro E Basilico Pasta Express was actually very delicious. I shouldn’t have doubted it. The sauce was thick and rich with a tomato flavor that was peppered with the right hit of basil. It was really quite delicious. The pasta, despite being nuked in a microwave, were cooked to that perfect al dente. The homemade rolls made the perfect side item for this meal. And even eating just half of the dish itself was more than enough. Very filling. But very, very good. I don’t know where to find more of the microwave meals from Le Veneziane, but I will keep my eyes open for them now. It’s nice to have a delicious and healthy meal in 10 minutes sometimes. So, let’s talk about ingredients, shall we? The Le Veneziane Microwaveable Gluten Free Penne Al Pomodoro E Basilico Pasta Express pasta is made from corn flour, emulsifier, and the sauce is made from tomato, cream, salt, melted cheese powder, onion, garlic, basil, and sugar. This is 100% gluten-free. As for the nutrition information, the Le Veneziane Microwaveable Gluten Free Penne Al Pomodoro E Basilico Pasta Express portion is 1 pack. In this serving, you will be taking in 350 calories and 7 grams of fat, 10 mg cholesterol, 820 mg sodium (um…yikes! ), 64 grams carbohydrates, 4 grams fiber, 3 grams sugar, and 8 grams of protein. See what I mean…it’s filling. And delicious. I want to thank Cuisine Cube for letting me try a new product from Le Veneziane that I didn’t even know existed. I’ll be on the watch now for more microwavable pasta meals by this great Italian company. This entry was posted in Bread, Cuisine Cube, Entree, Food, Giveaway, Italian, Mix, Pasta, Products, Review, Sauce, Vegetarian by The Celiathlete. Bookmark the permalink.